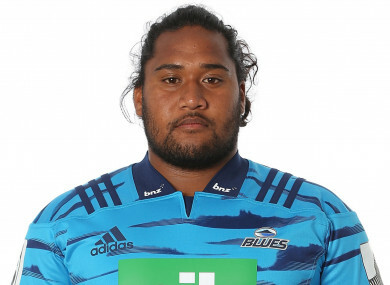 BLUES PROP MICHAEL Tamoaieta has died suddenly at the age of 23, New Zealand Rugby has confirmed. Tamoaieta made his debut for the Blues in Super Rugby last year and also featured for North Harbour. New Zealand Rugby chief executive Steve Tew paid tribute to the forward, stating: ”Our sincerest condolences are with Michael’s family at this very sad time. “Michael was a valued member of the Blues and North Harbour rugby environments and had been part of the New Zealand Secondary Schools team. He is survived by his partner Helen and daughter Aihara. The @NZRugby family sends its condolences to the family of Blues squad member Michael Tamoaieta who has tragically passed away. Email “Blues prop Michael Tamoaieta passes away suddenly at the age of 23”. Feedback on “Blues prop Michael Tamoaieta passes away suddenly at the age of 23”.